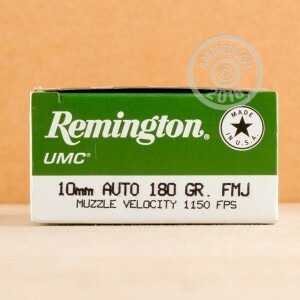 Grab a few boxes of this 10mm Auto ammunition from Remington UMC for your next range session. 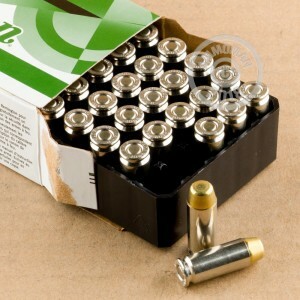 Each cartridge in this box of 50 fires a 180 grain full metal jacket ("metal case" in Remington's nomenclature) bullet at 1,150 feet per second. A great choice for owners of Colt Delta Elites, Glock 20s, and other 10mm pistols. Like other Remington UMC ammo, these cartridges are loaded in Arkansas using non-corrosive Boxer primers and brass cases. 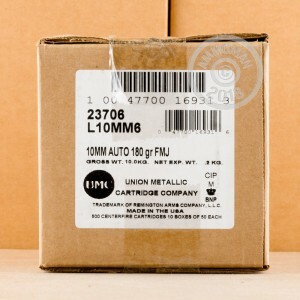 Grab all the ammo you need at AmmoMan.com--if your order exceeds $99, we'll include free shipping!